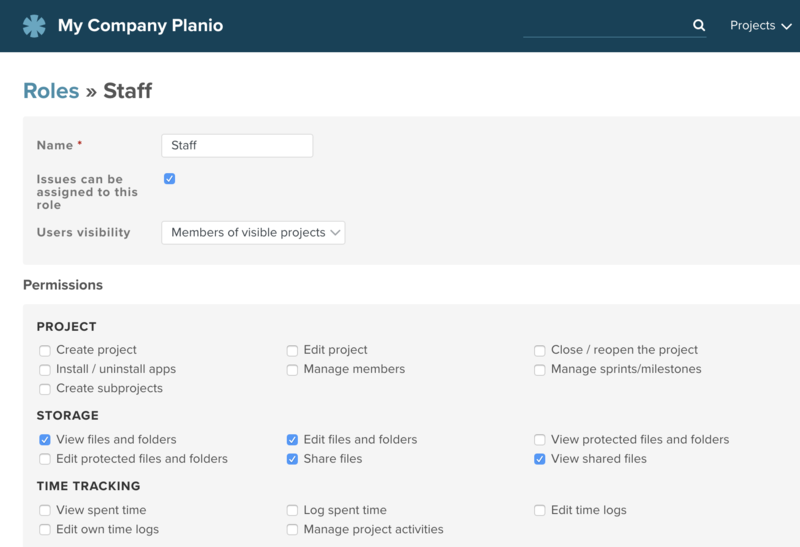 Planio Storage lets you set up a dedicated folder within any Planio project that will be synchronized across your team. All team members can access files using the web or directly on their devices using the Planio Storage Sync Client. 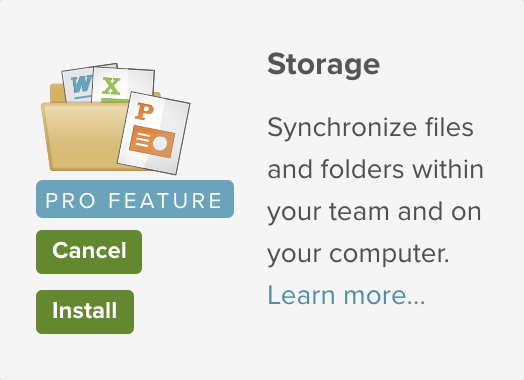 Within any project, install Planio Storage by navigating to the Apps tab. Depending on your current Planio plan, you might have to add Planio Storage for a small monthly fee. Of course, you'll be able to try Planio Storage for free until your next plan renewal. To sync your project's files and folders with your computer, download the appropriate client app first. Next, run the installer and enter your Planio domain, login and password. 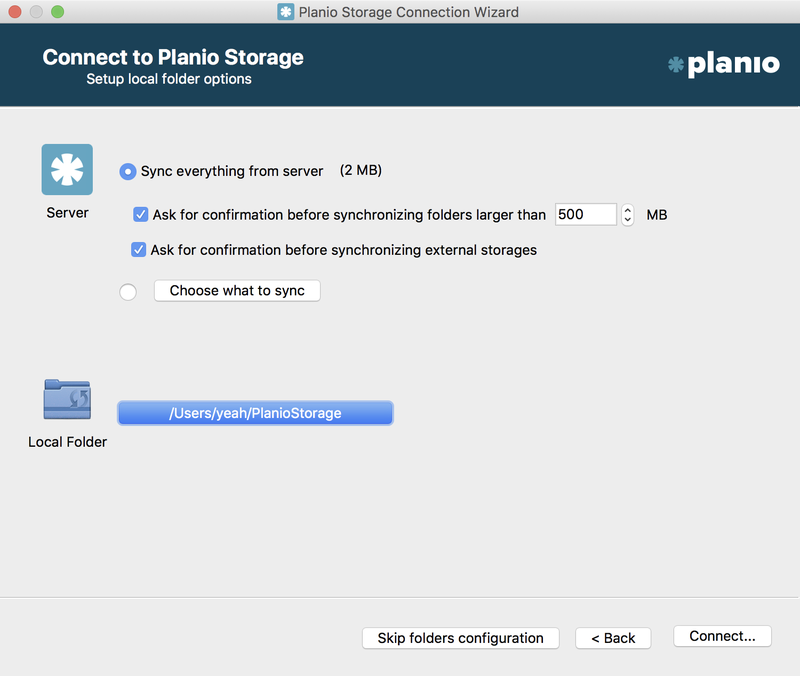 Planio Storage will allow you to sync everything from your Planio account or just the projects you select. You can also specify the local folder where Planio Storage files should be placed. Handling files and folders inside the synced folders works like you're used to and every change will be synced with Planio. Should you be offline during a change, the sync will happen the next time your device is connected to the Internet. 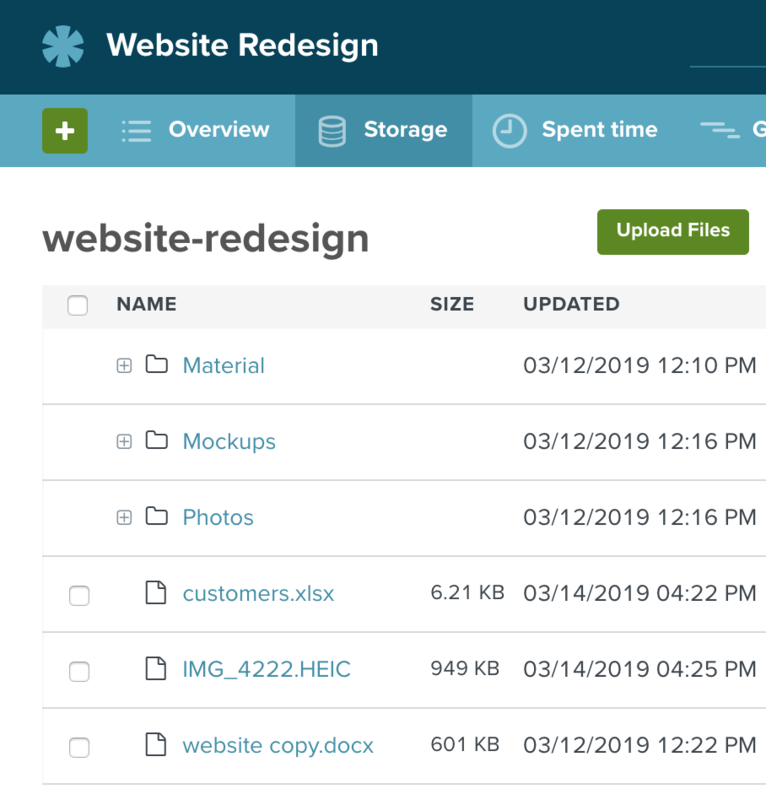 In case you and a colleague edit the same file while offline or during syncs, Planio Storage will create a copy of the file and you'll be able to merge your changes. You can manage files and folders right in Planio as well. Within your project, navigate to the Storage tab. Inside, you'll be able to upload any number of files from your computer by clicking on the Upload files button or simply by dragging them from your desktop into the browser window. You can also create folders as you would on your computer by clicking New folder. 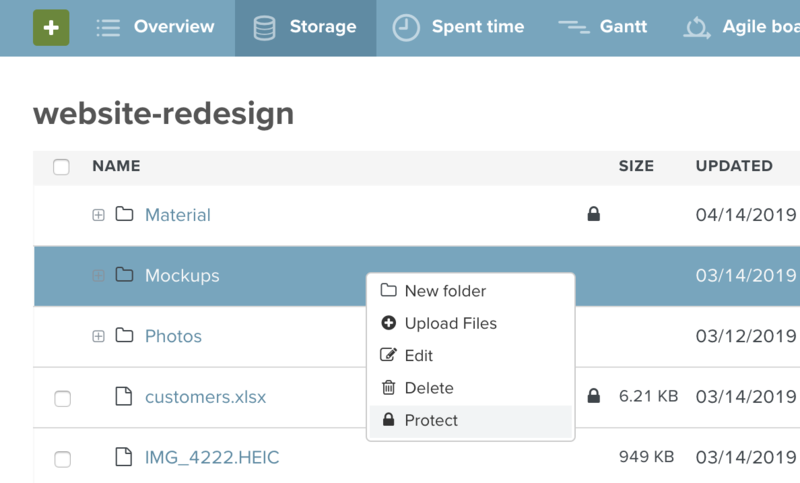 To visualize the files and folders in Planio Storage, you can either select Tree or Grid from the options menu at the top right. In case you don't wish to synchronize everything but access Planio Storage directly while online, you can use WebDAV. You can find a project's WebDAV URL in the Storage section's sidebar on the right. To connect, simply use your Planio login and password. To configure who among your colleagues and clients should be able to view and edit files, head to your avatar → Administration → Roles and Permissions. Then, select a role. Within Permissions → Storage, you'll be able to set permissions for the selected role. Enables users to access the Storage tab and browse files. Lets users upload, edit, and delete files. Enables users to protect files and folders. Protected items are hidden from other users unless they have the View protected files and folders permission. Allows users to view and download protected files. They cannot edit, delete, or set files to unprotected. Allows users to generate a sharing link for any file. Allows users to download files shared using a sharing link. Files and folders can be protected and thus hidden from other users. To protect a folder or file, click on the ... menu or right click the item. Then, select Protect. Protected files and folders are hidden from users who do not have the View protected files and folders permission. Users who do have the permission can view and download protected items, but they cannot edit or delete them. To edit, delete, or unprotect protected files and folders, users need the Edit protected files and folders permission. 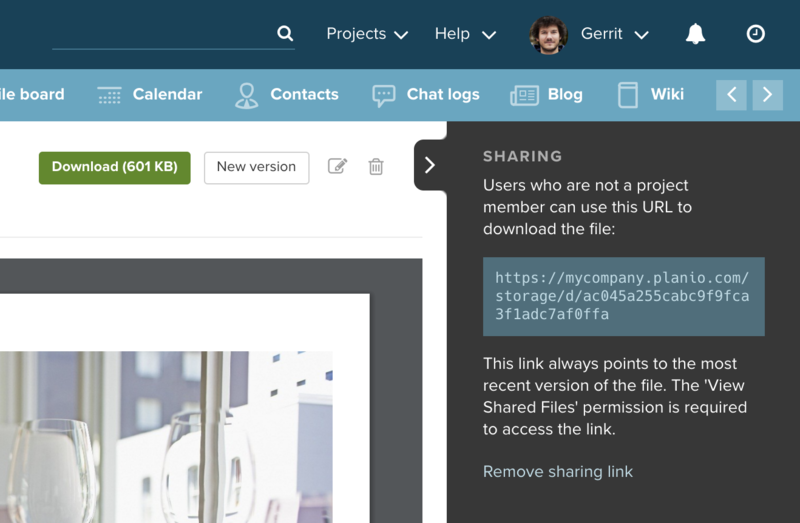 Single files can be shared with people outside of the project by generating a Sharing link. This is useful if you'd like to link to the file publicly or send a link to it in an email. To share a file, click on the ... menu or right click the item. Then, select Share. You'll be able to copy the sharing link in the next step. The link will always point to the latest version of the file–even if it has been updated after it was shared. Sharing links can be accessed by anyone who has the View shared files permission. By configuring your Non-member and Anonymous roles, you can define if that extends to everyone who has an account in your Planio or even to people who are not logged in. Our guide Make Redmine Projects Public on Planio has more information about this. You can create links in Planio Storage which point to files in different folders or even projects of your Planio account. To create a link, click on the ... menu or right click the item. 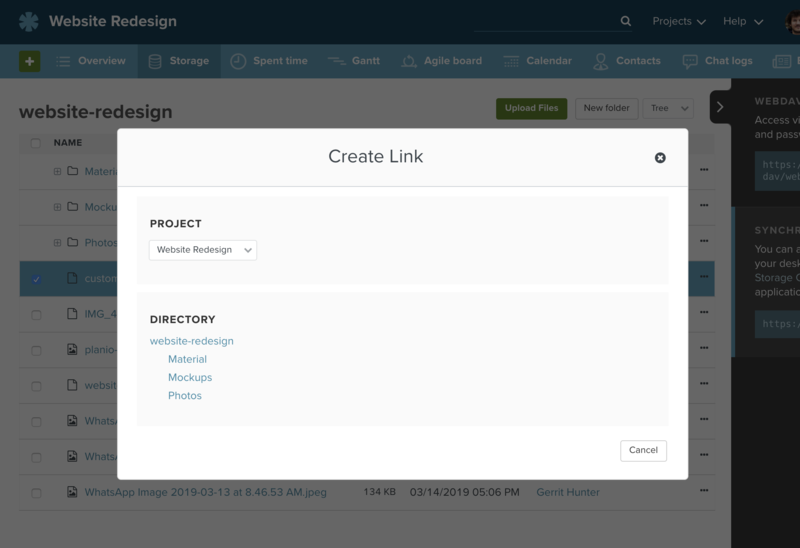 Then, select Create link. In the popup that appears, select the project and folder where the link should be created. Links will always point to the latest version of the source file. If a source file is deleted, all links will disappear as well. Users will always require permissions to view the source file as well in order to be able to view the link.